Originally started in 1997 through a grant awarded to Duke University Center for International & Global Studies (DUCIGS) by the Ford Foundation, for over two decades this program has supported graduate working groups across campus, each comprised of students from an array of departments, programs and professional schools who gather to discuss topics with a global focus. Included among the themes represented this academic year are Informed Choices for Equitable Development; Ocean Policy; Slavery, War & Gender; Global Environmental Health & Energy; and The Moving Aesthetics of Empire. Currently, DUCIGS is hosting twelve such groups, some of which are represented in our panel. Four of the interdisciplinary DUCIGS Graduate Working Groups on Global Issues will have representatives speaking on publications, special events and research activities they have been involved in during the 2018-2019 Academic Year. It will be inspiring to hear what has been accomplished. 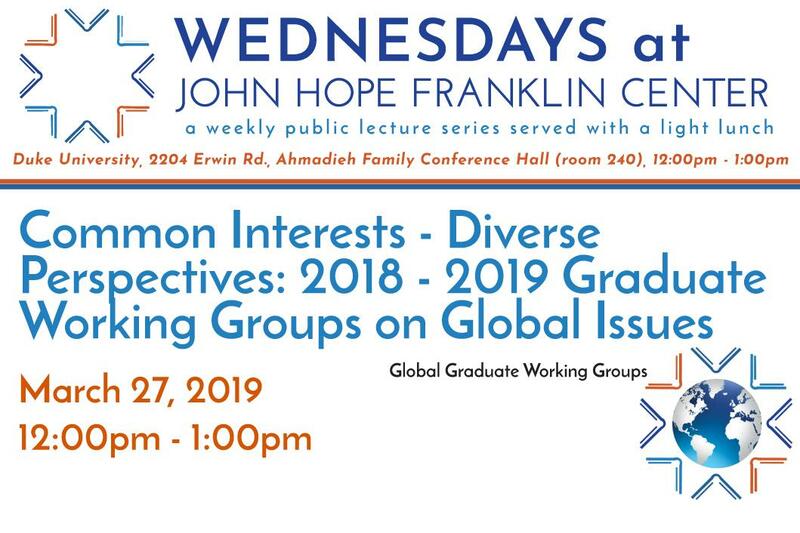 This presentation is sponsored by the John Hope Franklin Center, the Duke University Center for International and Global Studies. A light lunch will be served. Parking is available in nearby Trent Rd. and Erwin Rd. parking decks. The series provides 1-hour parking vouchers to guests.